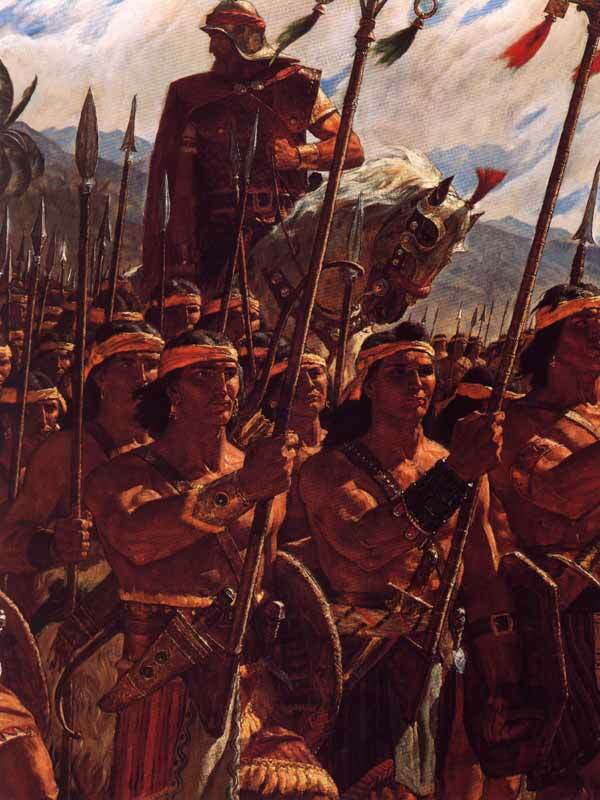 “Helaman's Two Thousand Stripling Warriors,” by Arnold Friberg. The Book of Mormon (which is revered by Latter-day Saints alongside The Bible) contains one of the strongest depictions of ideal manhood in religious literature. In the story of the two thousand stripling warriors readers gain insight into characteristics that, if developed in modern men, will lead to their improvement as individuals, husbands, and fathers. 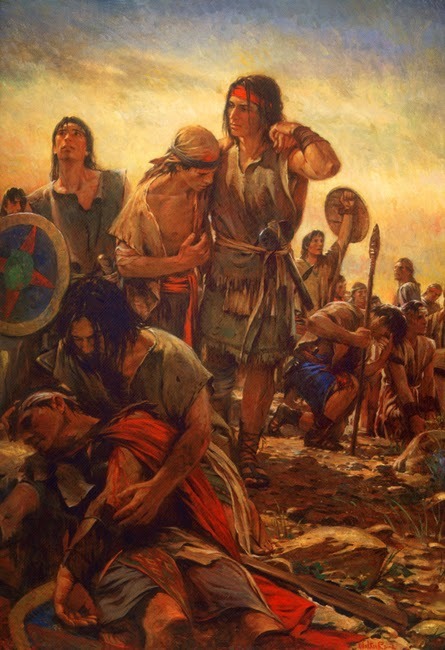 “The Anti-Nephi-Lehies Burying Their Swords,” by Del Parson. 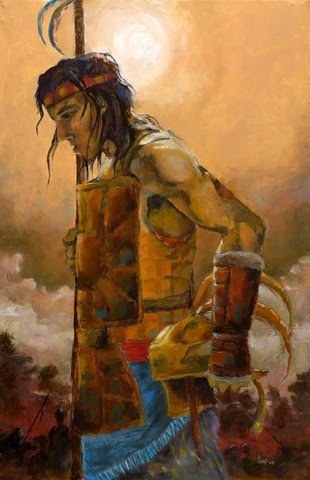 When a once-bloodthirsty tribe converted to Christianity, they buried their weapons of war and took an oath to never kill again. While their beliefs allowed for righteous warfare (defense of the innocent, preservation of freedom), they feared that they'd become hateful and murderous again if they took up the sword. So devoted were they to the oath, that allowed themselves to be killed by their enemies without resistance. 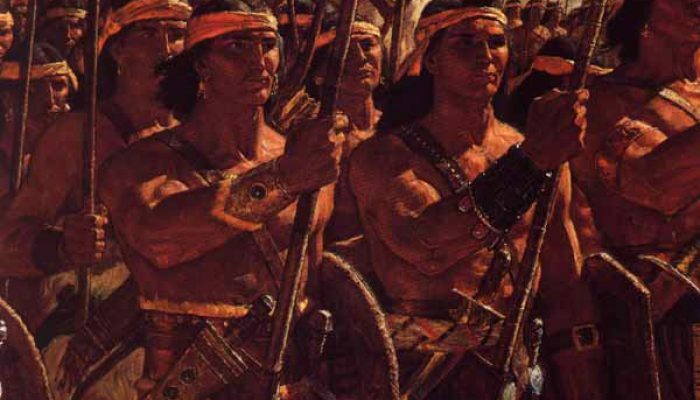 They gratefully supported a friendly army who offered protection, but upon witnessing the deaths of their allies, this tribe was on the verge of breaking their oath to God in order to join the fight. “And they were all young men, and they were exeedingly valiant for courage, and also for strength and activity, but behold, this was not all- they were men who were true at all times in whatsoever thing they were entrusted. Yea, they were men of truth and soberness, for they had been taught to keep the commandments of God and to walk uprightly before him. “Now they never had fought, yet they did not fear death; and they did think more upon the liberty of their fathers than they did upon their lives, they had been taught by their mothers that if they did not doubt, God would deliver them. 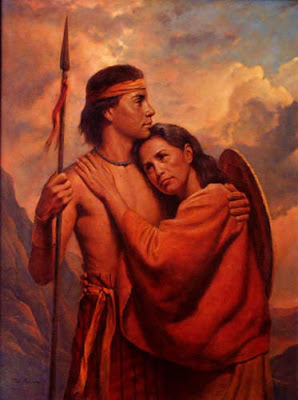 And they rehearsed unto me the words of their mothers, saying: We do not doubt our mothers knew it.” (Alma 53:20-21, Alma 56:47-48, The Book of Mormon). According to the text, these two thousand soldiers were miraculously preserved in battle. Although many were wounded, not a single one died, a miracle ascribed to the obedience and faith they learned from their mothers. If we review the passages above, we find a set of virtues, a prescription for ultimate manhood, which can benefit men's quest to be better individuals, fathers, and husbands. He will stand for the right even when it's not convenient or when he faces negative outcomes for doing so. 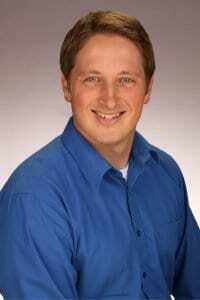 He will defend the honor of his wife and children, and will say no to activities that will diminish his ability to co-lead the family as an example of conscience. He will deny the cowardice that drives lesser men to blame their faults on others, avoid confession and change, and struggle to say “I'm sorry” or “I was wrong” out of vain fear of appearing weak. A stripling husband is strong and active. A stripling husband is reliable and true. A stripling husband is sober and obedient. A stripling husband isn't a fighter, but he's not afraid to defend. A stripling husband values his family's liberty more than his own life. He teaches his daughters and sons about the great women in family and world history, (first taking time to learn about them himself). He doesn't “tune out” when a woman speaks at work, at home, at church, or elsewhere. Most importantly, he hears, cherishes, and consults with his wife, embracing her value in his thoughts, words, and behavior. He is grateful for her unique talents, traits, and skills, and is quick to express that gratitude. He sees her as his equal partner.